Microsoft got some real good news earlier this week. According to a metrics company, Net Applications, Windows 8’s user share in August is now larger than Vista’s as compared to the contemporary post launch of both the operating system. According to the same source, Windows 8’s user share of all PCs running Windows, a tally that included Windows 8.1, the update slated to ship next month, jumped to 8.4 percent in August, Net Applications. The 2.5-point gain was a single-month record for the struggling OS, and more than double the previous record set in June. It was ten months after its January 2007 retail debut, Windows Vista, the operating system accounted for 7.3 percent of all Windows PCs. November 2007, i.e. the 10th month after Vista’s debut, was the first month that Net Applications used a new methodology that weighted data by countries. It was an attempt to come up with more accurate estimates for markets, such as China, for which it had relatively little data. Vince Vizzaccaro, Net Applications’ head of marketing, in May argued that it was pointless to compare Windows 8’s uptake with Vista’s. But in November 2007, the methodology was changed. Sources had been comparing Windows 8 and Vista adoption using pre-November 2007 data for Vista. The comparisons constantly put Windows 8 at the short end of the stick and offered its last update using Net Applications’ figures on May 1. 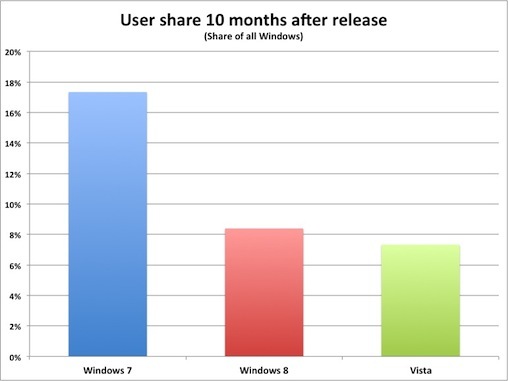 Even if Windows 8’s 10-month user share is larger than Vista’s, it still remains far behind Windows 7’s at the same point in the latter’s rolled-out. Well, ten months after Windows 7’s October 2009 launch, the OS could accumulate a 17.3 percent share of all Windows PCs which is more than double Windows 8’s. It is not yet sure as to what drove this massive increase in Net Applications’ accounting of Windows 8’s user share. Although a small portion of the gain, about one-tenth is expected to be due to the counting of Windows 8.1. According to Net Applications, Windows 8.1’s share of all machines running Windows is about 0.3 percent. Windows 8’s 2.5-point increase is the second-largest one-month gain achieved by Microsoft operating system since late 2006, when Computerworld began recording Net Applications’ data. This change is pretty impressive after the slow-down in Windows 8’s adoption during the month of July.